Our keroll rolling grille type AS 55 made from extruded aluminium is the secure, robust and attractive answer for shop entrances, arcades and shop windows and for securing windows and doors in homes. Protecting the system afterwards is very simple with the readymade box and along with the integrated anti-lift device it offers excellent protection against break-ins. The AS 55 extruded profiles are extremely durable and reliable. The discreet pattern gives you vision and ventilation for the same level of security. The AS 55 rolling grille can be installed in the most effective way possible as either a left or right roller due to the attractive appearance of both visible surfaces. Due to its spooling behaviour, the product is excellent for space-saving and retrofitting. The AS 55 can be supplied with the surfaces aluminium silver anodised (E6EV1) or powder-coated. This rolling grille, like all our gate systems, is constructed individually in accordance with customer requirements and the installation situation. 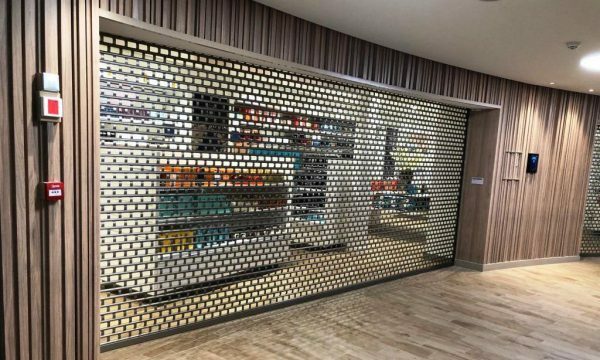 It can also be installed in the most effective way possible for existing shutter, rolling grille and gate systems as a backup profile! AS 55 – an excellent choice. Superior product characteristics, convincing quality and short delivery times have made the Type AS 55 rolling grille a best seller in our company. We will be delighted to talk to you about its possible uses and product details.